On 6 October 2013, the commemoration day of the conception of St. John the Baptist, the main event of the celebration of the 1700th anniversary of the Edict of Milan took place. The Divine Liturgy was celebrated in the square in front of Ss Constantine and Helen church in the Serbian city of Niš, the birthtown of St. Constantine Equal-to-the-Apostles. Celebrating were Primates of the Local Orthodox Churches: His Holiness Patriarch Bartholomew of Constantinople, His Beatitude Patriarch Theophilos of Jerusalem, His Holiness Patriarch Kirill of Moscow and All Russia, His Holiness Patriarch Irinej of Serbia, His Beatitude Archbishop Chrysostomos II of New Justinia and Cyprus, His Beatitude Archbishop Hieronymus II of Athens and All Greece, His Beatitude Archbishop Anastasios of Tirana and All Albania, His Beatitude Metropolitan Sawa of Warsaw and All Poland, and Archbishop Simeon of Olomouc and Brno, Locum Tenens of the Metropolitan See of the Czech Lands and Slovakia. 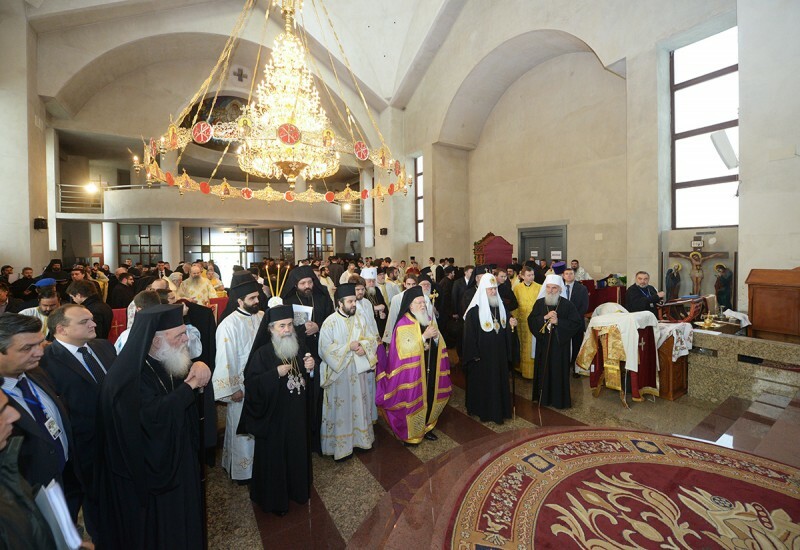 Serbian hierarchs and members of official delegations concelebrated. Praying at the service were President Tomislav Nikolc of the Republic of Serbia, representatives of the Serbian government, President Milorad Dodik of the Republica Srpska (Bosnia and Herzegovina), ambassador Alexander Chepurin of the Russian Federation to the Republic of Serbia, ambassador Victor Nedopas of Ukraine, ambassador Vladimir Chushev of Belarus, members of the diplomatic corps and public figures. Thousands of worshippers came to the service that was celebrated in the Serbia, Church Slavonic, Greek, Arabic, Georgian, Albanian, Polish, and Czech languages. Among those present there were representatives of the Roman Catholic Church and the Armenian Apostolic Church participating the celebrations. After the divine service, His Holiness Patriarch Irinej of Serbia delivered a welcoming address in which he underscored the importance of the event which happened 1700 years ago. Patriarch Irinej conferred on Patriarch Kirill and other heads of the Local Orthodox Churches the awards of the Serbian Orthodox Church the Orders of St. Constantine the Great. Metropolitan Hilarion and Bishop Sergy of Solnechnogorsk were also awarded the Orders of St. Constantine. In his address delivered in the square His Holiness Patriarch Bartholomew noted that Christians in different countries are persecuted at present, 1700 after the Edict of Milan. He expressed his concern over the fate of the abducted Syrian Christian hierarchs.